Moving water in a stream contains leaves that create interesting lines to contrast with smooth flowing water. 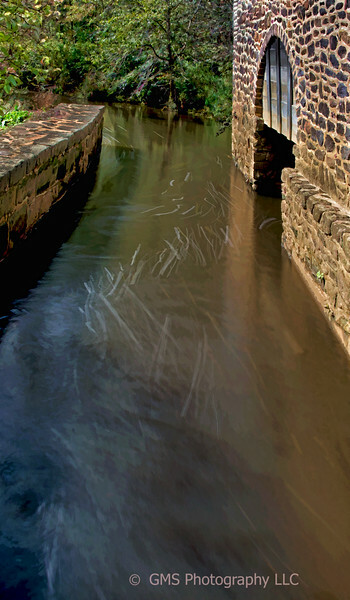 The stream passes the gate to an old gristmill at Walnford in Upper Freehold Township New Jersey. Walford is a historic park located on a 36 acre site in Upper Freehold Township New Jersey. A farmhouse on this property was completed in 1774 and occupied by five generations of the Waln family until 1973. The estate which also contains a grist mill is operated as a historic site by the Monmouth County Parks System to educate visitors about the history of this part of New Jersey in the 17th and 18th centuries.